"Phantasmic" redirects here. For other uses, see Phantasmic (disambiguation). The Phantasmic Oasis Trap is a Hydro type weapon. No longer a sanctuary in the midst of a desert, the Phantasmic Oasis Trap entrances and consumes any who dare venture too close. The psychedelic colours may be enticing, be beware! The phantasms and spirits that now inhabit this trap are cruel and merciless! The Phantasmic Oasis Trap is not sold by any Trapsmith. It can only be crafted given the proper ingredients. 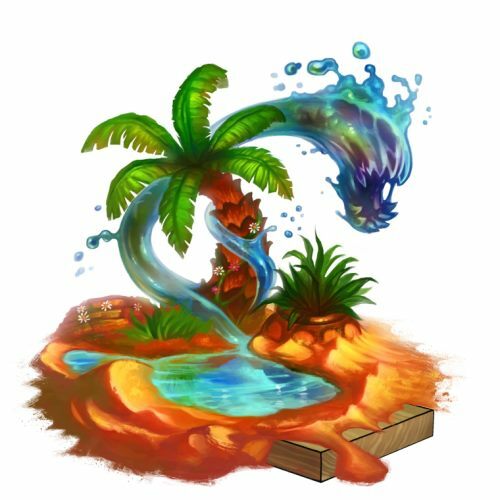 The Phantasmic Oasis Trap (if unintentionally smashed) can be reassembled from Phantasmic Oasis Trap Parts. 14 November 2012: The Phantasmic Oasis Trap was introduced with the opening of the Living Garden. This page was last edited on 27 January 2019, at 01:21.